Series 8000 air and vacuum pump features a single diaphragm and positive displacement – and delivers 1,000 hours of continuous duty. Energy efficient and durable, the Series 8000 pump utilizes a long-lasting flapper valve design. Available in a 12 or 24 voltage option, this pump is best known for its ability to move air/gasses from an inlet and deliver it to an outlet. Customers also get an option of using a Buna-N or Viton® o-ring. 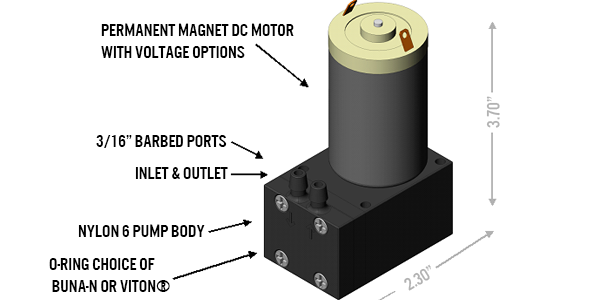 The pump body is nylon with a permanent magnet DC motor. Note:Our products are subject to continuous improvement. To achieve this goal, Smart Products USA reserves the right to change features, processes, materials, testing and other specifications as necessary. All plastic body material recommendations are based on standard corrosion resistant and compatibility guides. Smart Products USA strongly recommends that customers test products for each application-specific use. Buyer is urged to test and investigate the compatibility of any substance used with our products prior to actual use. Seller will not be responsible for the failure of Buyer to thoroughly test and investigate the compatibility of the substances used with our products and the fitness of the products for its particular use or application.